We seem to have recovered from our chocolate induced Easter Monday coma. Far too many MaltEaster Bunny's have been consumed in this household! A number of polishes that I got during the last few months were some the new aEngland Legends collection. There are heaps of awesome swatches out there of this collection, which of course meant I had to get them. 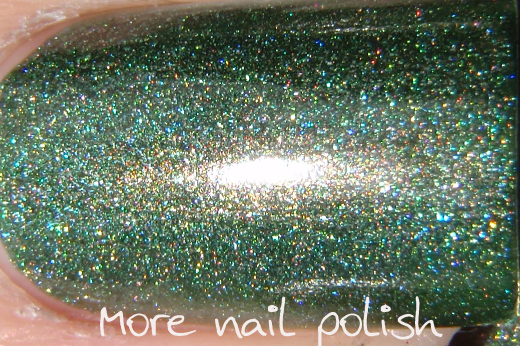 This is Dragon, which is a dusty green polish with a golden shimmer and a light holographic effect. 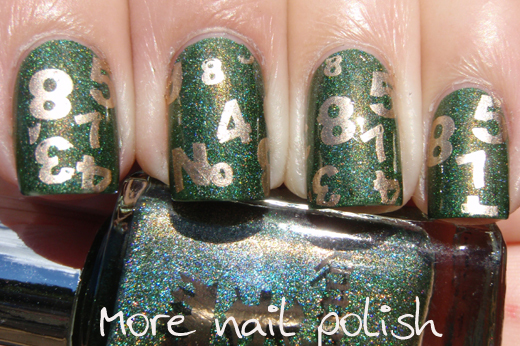 I love that this polish is a true one coater. 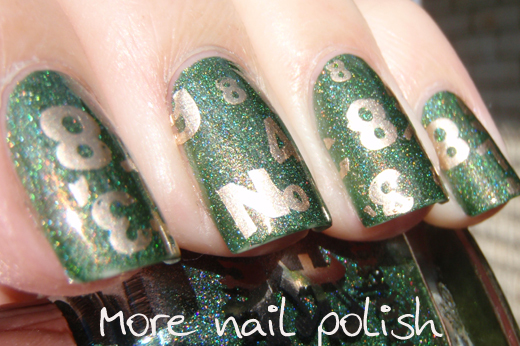 After wearing my Lynnderella's for such a long time, I feel I can't just wear a plain old mani at the moment, so I pulled out my stamping plates and chose this cool number image off some plates I recently got through Fab UR Nails blog. This was plate QA9 from the QA image plates. 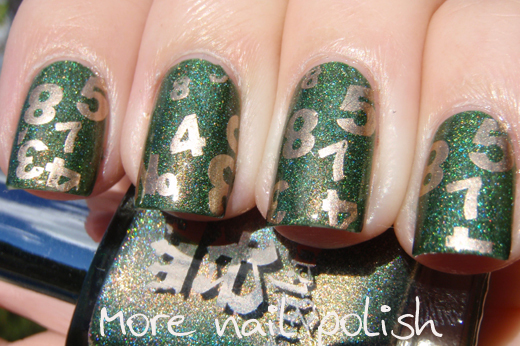 Stamping was done using China Glaze 2030, which matched the golden undertones of Dragon really well. 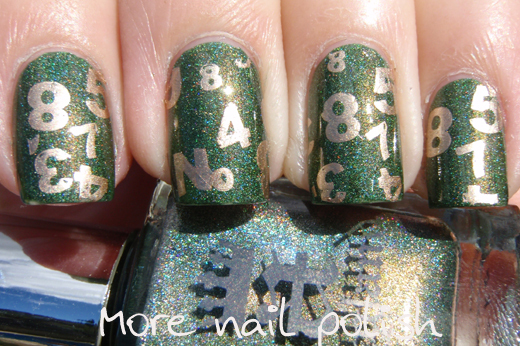 And for my little boy who is learning the shapes of different numbers, this mani is pretty cool. For the record, here is aEngland Dragon on it's one. One single coat over Orly Bonder base coat. The holo effect is subtle on the nail. The holo particles are very fine and totally smooth, but I don't think you could really call it a linear holo. Gorgeous nail polish tough! Back to work tomorrow after four lovely days off. At least it's a short week! I love finding new plates that you don't see everyone using! Ummm Dragon is so pretty, it was my first choice of which aEngland to try first. What an interesting green holo. 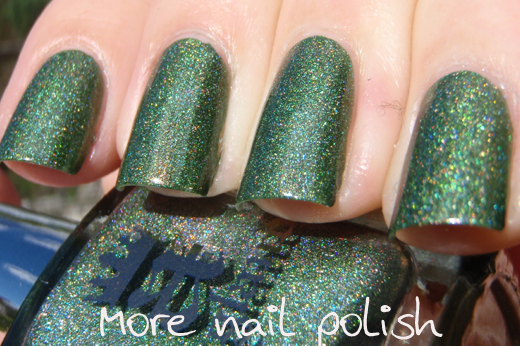 Not a common green to come with holo, and the stamping is adorable. The holo isn't strong, but I love the golden shimmer. Thank you. Thank you. I'm actually lucky that the gold went with it so well, as I really only have gold, black or white to stamp with. Very cute stamping and perfect color combo! 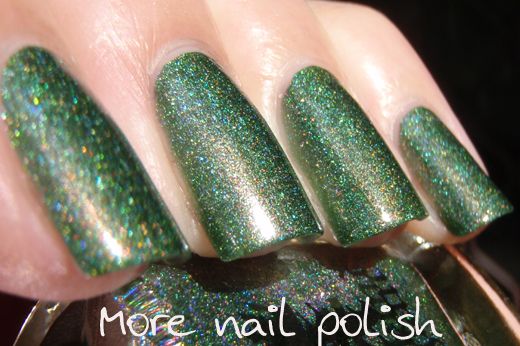 Such a gorgeous green polish! I love it! Dragon is a gorgeous green! Love the look of the new BM plate, I hope they are all as good as that preview. Thanks! I love this colour! I wanted to buy this one and Saint George at A England's recent sale but they were sold out. They will be mine, though! I got most through llarowe, but she was sold out of Saint George, which I got through aEngland, that it was a few months ago now. Love that they have free international postage. 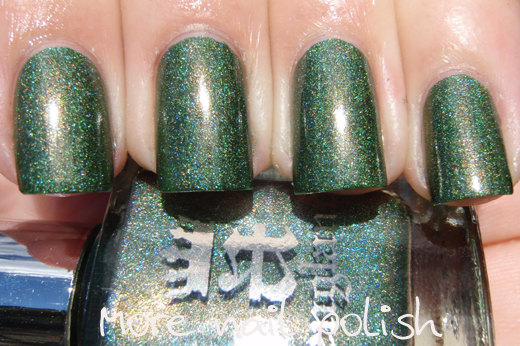 A-England Dragon is one of the lemmings on my list I hope to cross out soon - So gorgeous! I like how you varied the placement of the stamp on each nail as well! Dragon is gorgeous, definitely one for the list! Re the stamp, there are two number stamps, so I mixed them up a bit and there is actually a bit of a gap in the prints, so I would just add a different individual number one at a time at the end. This is a unique and beautiful green. My pleasure. I'm really happy with the plates, they stamp very nicely! Love what you did with that awesome polish. Thought #1 = I need to stamp more. I have tried a few times and sucked every time. I need to practice. Thought #2 = I do not own any A Englands and need to remedy this situation! Re thought #1 - yeah, stamping takes practice, I always make sure I do my right hand first, as that helps me get the crap stamps out of the way! Re thought #2 - what no aEnglands - yes remedy this ASAP, recs are Dragon and Saint George.